“I do not approach virtue from a religious perspective. This book is not about being a virtuous person, if you hear that word as referring to being pious. This book is about locating the essence of our soul, and coming to have an inner sense of how soul wants to function in the world to bring about the good. We are now accustomed to hearing about soul in its sufferings, its need for beauty, its love of story, myth, creativity, and more recently, the soul of the world. Soul also wants to act. And when we enter deeply into soul life, we become receptive to what comes to us from the spiritual worlds. The virtues constitute the way of sacred service in the world, for they are the means through which we serve the soul and spirit of other human beings. Only when we serve in this manner can a whole community flourish. Participants are asked to read the “Introduction,” the first chapter, “The Twelve Spiritual Virtues,” and the last chapter, “Working with the Virtues” before the start of the first class, paying mindful attention not only to the material in the book, but also to any reactions, including memories, dreams, and reflections. The idea is that we all have something very valuable to contribute to the endeavor of coming into contact with the soul virtues, and that together we can take unique steps toward putting the virtues into everyday practice. Class size is limited to 10 participants. If you would like to be informed regarding upcoming Soul Virtues courses, please . . . The Power of Soul is a practical approach to knowing the spiritual world emanation, represented by the twelve virtues and how it works into our soul and bodily life in furthering our evolution into humanity. By coming to a “KNOWING” of the spiritual, soul and bodily interplay of the twelve virtues, our incarnation can become a conscious soul life that is connected to the spiritual world, enabling virtue to be lived right here on earth. 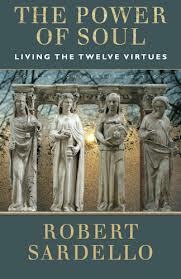 It is a practical guide complete with the phenomenology of the 12 virtues as related to humanity, alchemical processes an exercises for the reader to experience. This book is a treasure, which you will want to refer to over and over again if you are involved in any type of spiritual or soul work. Robert Sardello is a major figure in America’s rediscovery of soul, reacquainting thousands with its importance and vitality.